Laminate flooring has become the flooring material of choice for many homeowners in the past several years. There are many good reasons for this. Notably, it needs very little maintenance (unlike carpet), it is incredibly durable, and it comes in a vast array of colors/styles. Since being introduced to the US back in 1982, laminate flooring sales has seen a growth of up to twenty per cent per year. This article is a step by step guide on how to install laminate flooring and underlayment in your home. If you would prefer to have a specialist do the installation rather than DIY, find a contractor the easy and secure way. I recommend checking out local reviews at Angies List — exclusive discount for readers — get 45% off! This type of job is much easier than installing hardwood floors. Many of the tools are the same. Whatever you do, dont buy cheap planks, but do look for a laminate flooring sale. Look for a brand name like Bruce, Armstrong, Pergo, Quickstep, or Mannington. Likewise, when purchasing underlayment, go for quality. Buy a thicker type with the vapor barrier attached. Some manufacturers recommend 3 in 1 underlayment. Regardless, ask about the acoustical qualities. Quiet Walk and Whisper Walk are both good brands. In order to know how much laminate flooring and underlayment pad to buy youll need the square footage. To get this simply measure the areas footage right to left and then forward and back. Multiply those figures together and that is your square footage. Its prudent to add at least 5% to 10% to that figure to allow for scraps. If youve got another type of flooring, this is the time to get rid of it. Pull up your old carpet and padding. Remove all of the tack strips around the rooms perimeter. You may need to scrape the floor to get rid of any padding sticking to it. Vacuum the floor well. Dont attempt to sweep if you pulled up carpet and padding; a dust cloud will ensue. If there are any noticeable dips, level them out. On a concrete slab, thinset may be skimmed on it. On a plywood or OSB subfloor, use a non-shrinking wood putty. Remove the baseboards. You may be able to save these if youre careful. Now use the coping saw to cut off the bottoms of door jambs, case openings, etc. This will probably be 1/4 to 3/8 dependent on the combined thickness of the floor planks and underlayment pad. Time to Install the Underlayment and Laminate Flooring! The first thing to do is roll out the underlayment pad with the vapor barrier faced up. Connect the pieces together with wide, clear, plastic tape. Laminate flooring is a type of floating floor, meaning that it is all connected to itself but not secured to the subfloor. With this in mind, leave 1/4 clearance at each wall. On the initial wall where you start, use spacers that you can pull out before installing the baseboards. Getting Started and Running With It! In most cases, you can just start with a full-width plank on one wall. How your laminate planks connect depends on the brand you buy but they are all rather simple; most simply snap together. Remember to stagger the joints. Things will get tricky as you go through doorways; the manufacturers instructions most likely wont tell you about this because it impedes sales to DIYers. In some circumstances the best solution is to use your utility knife to trim the snapping connections on the adjoining planks so that they can slide together. In this case, use a few drops of wood glue to keep them together. 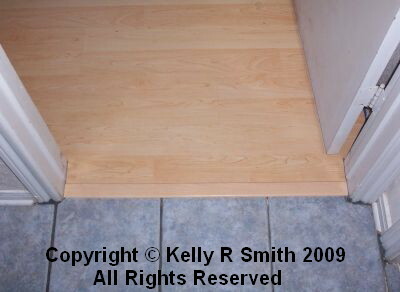 Once youre done with installing the laminate flooring planks you can get on your baseboards. If youve been careful with the removal you can reuse them. Otherwise, decide on which type of baseboard you want to install. Keep in mind; only nail into the framing bottom plate and studs. Keep your laminate floating! Do you have any installation tips I havent mentioned in this article? Share them in the comment section below!